That final ‘comma’ saves ‘the / weeping tree’ from cliché. ‘Bosnia boy sends postcard home’ is more biting. The boy in Australia is ‘gagged / by the desert grit that gets / shaved off the salt lake’ (When I saw Jimi, 41). He dreams of warriors and dragons, and his mother in Bosnia pregnant with him. The poem closes with the boy imagining himself cutting open his mother’s belly and escaping ‘into the / mountains, at home in the cold, / with tata and the warlords’ (When I saw Jimi, 41). A bee sting the least of them. ( ‘Afraid at Stadsparken’,  Kiss of the Viking, 17). Maclean often favours short, crisp lines, without use of articles, giving some poems a clipped tone. In ‘Made in Sweden’ this is used to effect to emphasise a change of tone, achieved when in the final stanza the introduction of articles softens the diction and the poet is made to ‘smile’ (Kiss of the Viking, 7). A curt tone, achieved in ‘Brute Force’ through lists of snappy images – ‘Woolies Saturday mornings / Eye shadows Cadbury’s eggs / Guilty as charged Caught in the act’ and ‘Back of the class / Soggy sandwiches Chop / of the desk lid’ – unsettles as it performs its title (When I saw Jimi, 11). Another list leads to a turn in ‘Axolotyl’, where a five stanza catalogue of images culminates with ‘the walking fish outside the Bio Lab // speared by Cousins with his compass’ (When I saw Jimi, 58). Maclean juxtaposes horror and the mundane: a fresco of ‘a starving man / with the eyes of Faust / … eating a newborn baby’ beside the traveller’s observation that the tour guide mispronounces ‘Prague’ (‘Gawp’, 19). Perhaps her poems are souvenirs; she writes ‘I love souvenirs Not the Kiss me Quick sort / but the ones that pull the world apart’ (‘Port Campbell near the Cave that Echoes’, When I saw Jimi, 35). Those of the bipedal hop. Carnivores. of the strange. Spoon-nosed folivores. It may be that Hannaford sometimes tells too much: ‘animal objects who amplify / the distortions of this interior wilderness’ (Curio, 6). 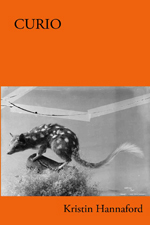 The poems are a necessary testament to a world of human-other animal and colonial relationships in Australia, told as women’s history. The concept is brilliant. Hannaford attends to the tragic detail of taxidermy: ‘Your White-faced Heron should appear tentative, neck retracted and settled, / as if contemplating the missed arrival of the tide’ (Curio, 8). She describes the husband as cabinet maker (Curio, 7), the ‘Tools of the Trade’, and the processes that lead to the final stuffed creature (‘Flaying’, ‘Fleshing’, ‘Curing’, ‘Scouring’, Pickling’, ‘Tanning’, ‘Drying’). In ‘Pickling’, the local Wathawarrung women are both recalled and backgrounded, as the nineteenth-century colonial voice takes over. The colonial history of stealing human remains is told in ‘ Sarophagus: E18184’ (Curio, 37). all from a creature but its name. Hannaford’s documentary poetry concludes with an evocation of the souvenir in 2013—’And all these / trinkets? Our curious ruins’ (Curio, 59)—the tragic undertow of the desire to keep, that is death. This entry was posted in BOOK REVIEWS and tagged Anne Elvey, Julie Maclean, Kristin Hannaford. Bookmark the permalink.